Learn about how Gartner evaluates vendors’ abilities to help clients with their content services strategies. Anadolu Hayat Emeklilik transforms customer communications management to help teams access, store and share content faster. Unified Grocers uses IBM Content Navigator to provide users with quick and easy access to a rich store of electronic content. Banco Galicia uses IBM Content Navigator to access electronic archives swiftly and seamlessly on PCs and mobile devices. Explore how Ferservizi removes paper-based processes, introduces automation, and empowers staff to work more effectively. See how Content Navigator empowers users to access, manage and work with enterprise content anywhere, anytime. IBM Content Navigator offers a universal interface for a secure, collaborative ECM experience. 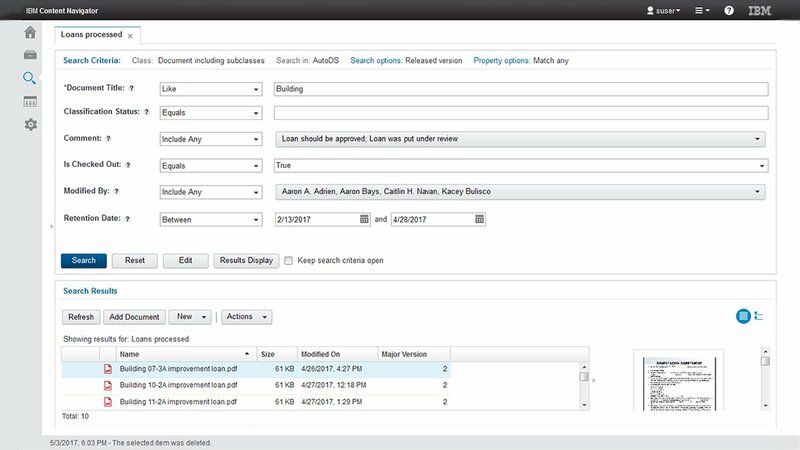 Direct who sees what with role-based redaction capabilities from IBM Enterprise Content Management. Learn how IBM ECM solutions address content management issues for employees that rely on content every day. Discover how your industry can gain real value from your business content with IBM ECM solutions. Help lower costs, reduce errors and free employees from repetitive back-office tasks with robotic process automation and ECM.